THE ABRITEL SITE ALLOWS YOU A PAYMENT BY BANK CARD BUT YOU CAN DIRECTLY ADDRESS US TO US, CHECK BY CHECK OR TRANSFER. TEL 0608367170 DO NOT HESITATE TO CONTACT US. WE ARE ALSO ON THE RIGHT CORNER. LOC FROM SUNDAY TO SUNDAY IF POSSIBLE. POOL TREATED WITH SALT. THROUGH THE SHELTER THAT SECURES IT: 25 ° FROM MID APRIL TO MIDCTON. Provencal villa close to the center of the village of ST SAT. with panoramic views of the valley and the Luberon with swimming pool salt 10 X4 protected by a telescopic shelter guaranteeing a water 25 ° from April to October which you can adjust the opening according to your desires and weather . Pool secured by the shelter that can be fully closed. Family home that can accommodate three couples with four children or four couples without children. Comfortable for 10 people and up to 11/12 pers. for short stays. 5 minutes walk from the center of the authentic village of St Saturnin Les Apt with its medieval citadel, mill, numerous hiking trails, shops and Tuesday market. Within 15 minutes the famous villages of the region you can visit, such as Gordes, Roussillon, Ménerbes, Lacoste, Bonnieux and the cedar forest, Rustrel and the Provencal Colorado ... it is as close to the Vaucluse and Fontaine L'Isle sur la Sorgue. In just 10 minutes we are in Apt (large market Saturday morning, many shops and water) and 3 km from golf Villars. A little further, but less than an hour, is Lourmarin, Cucuron, Aix en Provence, Marseille, Cassis and its creeks, or to the Pont du Gard, and the Verdon Gorges, or at the top of Mont Ventoux or Avignon. We park without problem 4 cars on the property. In the spring, we eat under the arbor near the barbecue and plancha. Relax in peace on one of the 3 sunny or shaded terraces overlooking 4000m² of land planted with cherry, peach, apricot, plum, fig, pomegranate, almond, walnut, hazel, olive, etc. In the evening you can enjoy the view of the old castle and the illuminated cliff above. Enjoy the petanque field being finished landscaping near the pool (bowling games available) with next to the swing. Recently installed: the wooden blade terrace by the pool. TAXES OF STAY: 2. 50 € per adult and per night, free for children. BABY BED, HIGH CHAIR AND CANNE STROLLER. Thanks see you soon ! Two bathrooms with shower and sink, bathroom with bath, basin and toilet plus a separate toilet. The house is comfortable for 10 people. We can go up to 11/12 for short stays. Beautiful house in pretty village, great for families. We had a relaxing stay with friends and family. The kids fell in love with the pool and the garden. Everything was very easy. The house is well equipped with everything you might need for a home away from home. Local walks, including the short climb up to the chapel and ruined castle, were very picturesque. There are plenty of places worth a visit in the area but the Mareva itself is an oasis of calm that you may not wish to leave. The local bakeries, butcher and the Spar are well stocked, as is the Tuesday morning market. The village restaurants and bars are all very friendly, and the supermarkets of Apt are a short drive away. Wish we could have stayed for longer. Our thanks to M and Mme Bernier. Nous avons passé un excellent week-end de Toussaint. La maison est très bien équipée et fonctionnelle. La vue sur le Luberon, est superbe. Wir haben kurz vor dem Beginn der Hauptsaison mit 6 Erwachsenen und 2 Kleinkindern 2 schöne Wochen im Haus der Familie Bernier genossen. Der Ausblick auf den Luberon ist fantastisch - Bäcker, ein kleiner Supermarkt und einige Restaurants im Ort sind fußläufig erreichbar. Die Gastgeber sind sehr freundlich und hilfsbereit - man merkt, dass sie selbst jedes Jahr einige Monate im Haus verbringen. Unsere Kinder haben sich auch über die Schildkröten und Fische gefreut, die wir täglich gefüttert haben. Wir kommen gerne wieder! Das Haus mit überdachtem Pool haben wir zwei Wochen in den Pfingstferien sehr genossen. Es ist genug Platz für 2 Familien mit ingesamt 5 Kindern, alle wünschenswerten Elektrogeräte sind vorhanden, ebenso schnelles WLAN (rund 7 Mbit). Das Wetter war in dieser Zeit wechselhaft, weshalb wir die Überdachung des Pools nicht zurückgeschoben haben. Dadurch war es auch bei unerwartet schlechtem Wetter immer warm genug für Badefreuden, bei starker Sonne schützte das Glasdach die tobenden Kinder vor Sonnenbrand. Die Eigentümer kümmern sich liebevoll bei auftretenden Fragen, leben ansonsten im Dorf und achten die Privatsphäre ihrer Gäste. Die Zimmer sind zweckmäßig eingerichtet, der herrliche Blick auf den Luberon ist von 4 der 5 Schlafzimmer möglich. Unser einziges kleines Problem war, dass die Kinder zu viel Wasser aus dem Pool verbraucht hatten und wir mit dem Gartenschlauch nachfüllen mussten, damit die Pumpe das Wasser reinigen konnte. nous avons passé un superbe week end en famille (7 adultes et 3 enfants ) du 5 mai au 8 mai dans cette merveilleuse bastide. les enfants ont bien profité de la piscine chauffée et couverte , ils se sont éclatés a admirer la famille tortue et fait des gros câlins a "sunday" le chat . nous avons aussi bien profité des ballades alentours ....et le retour au calme dans cette demeure d une propreté impeccable et d un confort appréciable. les propriétaires sont d une gentillesse exemplaire sans être imposants , de bons conseils et très compréhensifs. 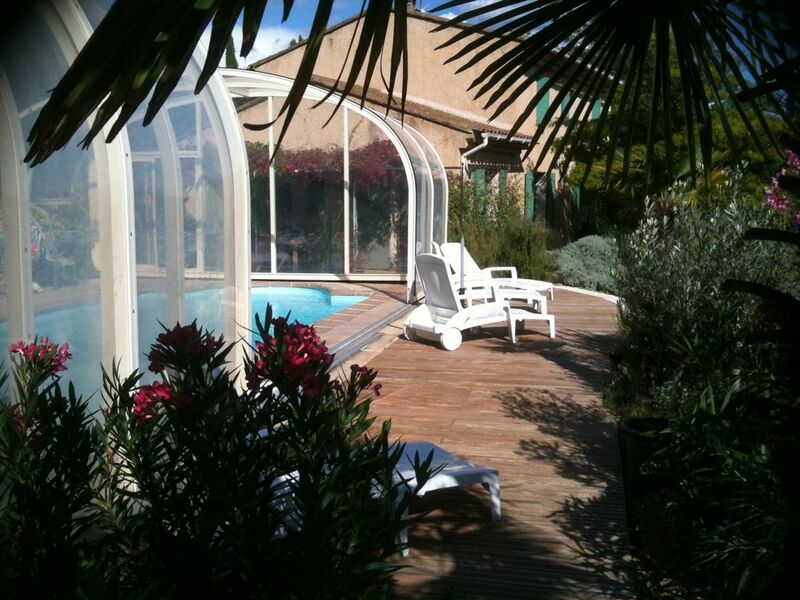 Je vous recommande cette maison pour un week end ressourçant..
Nous sommes venus à Saint Saturnin les Apt pour fêter la nouvelle année entre amis: trois couples et six enfants. Les enfants ont profité au maximum du jardin (même sans la piscine, car en décembre, il fait un peu froid). En effet le terrain est grand et bien sécurisé. La maison est très agréable: une grande cuisine, une salle à manger et un salon, c'est parfait! La literie est bonne et nous avons apprécié les trois salles de bain! Un autre avantage, en sortant de la maison on est directement dans le village pour une jolie balade. Je vous recommande la Mareva.